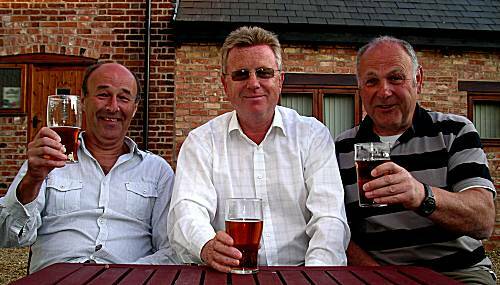 The brave and famous crew met before 8-30 at Alan's House at the start of their latest 2 week narrowboat adventure. The crew spent some time packing their belongings into Neil's car before setting off on the journey to Napton Marina. Sufficient provisions were purchased at Sainsburys in Rugby for the start of the expedition. Due the extreme pressure they were under, they declined a fried breakfast at the supermarket and headed directly to the boatyard. 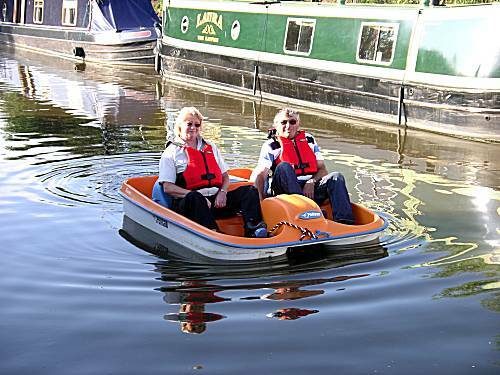 The staff at the marina, expecting the crew and recognising their exceptional skills, were quick to allocate the narrowboat "Amelia" into their care. Despite being moored in a tight corner of the marina surrounded by numerous other boats, Ron accurately manoeuvred the boat in reverse into the open waters and turned the boat precisely towards the exit, much to the admiration of the marina staff. The adventure had started. Leaving the marina the tight turn onto the feared Oxford Canal was made and the narrowboat headed for the first obstacle, being the flight of 9 Napton Locks. 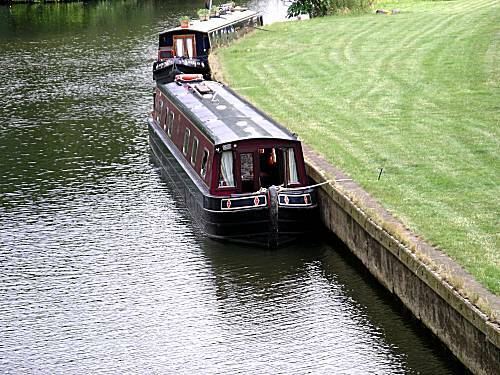 Courteously mooring before the first lock the crew were horrified to discover that a narrowboat with a German crew overtook them and stole their position to ascend the flight of locks. The crew were incensed at this discourteous act and considered this to be a deliberate attempt by the Germans to scupper their mission. Over the course of the next 9 locks several daring attempts to regain their position failed and the crew considered that all out war must be declared. However, on reaching top lock the superior power of narrowboat Amelia prevailed and the German boat soon gave up and moored in defeat. The crew, pleased with their performance, quickly tasked Ron to prepare a dinner of Spaghetti Bolognaise, which was enjoyed with a bottle of excellent Red Wine. 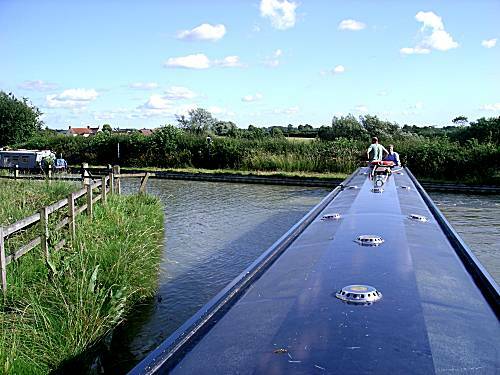 After their meal a long section of canal unfolded before them through miles of superb countryside, before identifying a possible canalside pub destination at Fenny Compton. The crew decided that a determined effort must be made to reach this destination despite an anticipated late arrival. 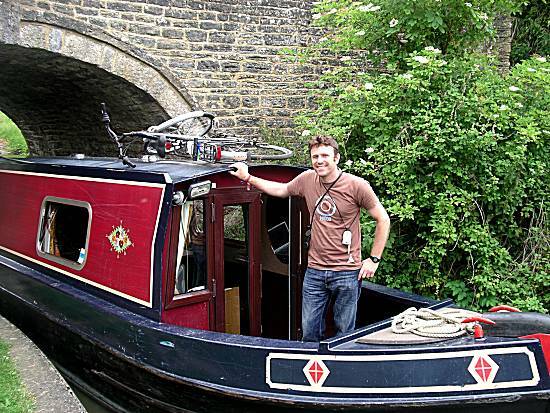 With Neil at the helm and with exceptional effort, the narrowboat was navigated to Fenny Compton, arriving at 8-40pm, when the crew hurried to The Wharfe Inn to sample the ales on offer. They were horrified to find Spitfire Ale on sale at £3-10 per pint and after just one pint changed to Adnams bitter at a mere £2-80!! They returned to the narrowboat for small portions of cheese and biscuits, before retiring to their bunks after an exhausting, but rewarding day. They drifted to sleep in the knowledge that they were well ahead of their planned schedule and satisfied that the Germans had been thoroughly defeated. A restful night for the weary crew was enjoyed until at some time around dawn they were rudely awoken to the sound of heavy footsteps on the roof of the boat. Neil thought this to be a moorhen, but Alan advised that the heaviness of the steps must have been made by a passing flatfooted platypus. Neil prepared portions of pleasing plentiful porridge, as the crew got ready for a swift departure from their moorings at 8am. Alan carefully navigated the narrowboat out of Fenny Compton and through the narrow "Fenny Tunnel", which due to brittle rock was converted into a deep and dangerous gorge, some time in the distant past. Progress was good through the 5 Claydon Locks without the hindrance of the alien German Boat. The following 3 locks were busy with other craft, but the narrowboat battled on with its mission. The narrowboat moored before the picturesque 'Cropredy Lock' for a splendid late breakfast including mushrooms. 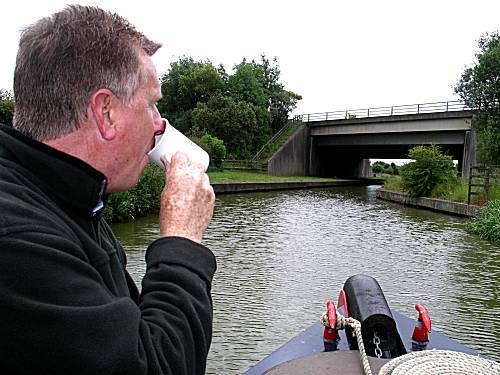 Whilst Neil continued to battle with the helm, the others were relieved to see the craft cross beneath the M40, whilst drinking nerve calming tea. With great relief the crew were amazed to see the outskirts of Banbury in the distance. However, on reaching the centre of Banbury they were horrified by the congestion. After Banbury the waters became calmer and appeared safer despite encountering a number of very deep locks. 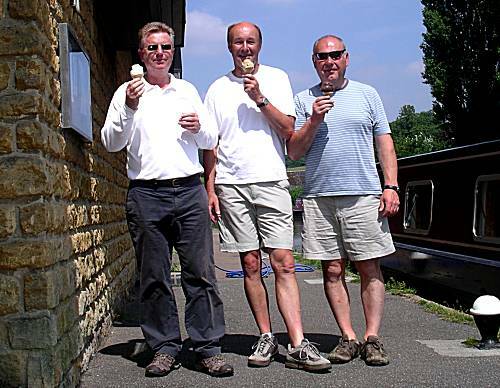 The crew felt need to stop briefly in the safety of 'Kings Sutton Lock' to enjoy some Magnum Ice Creams (Classic Variety). 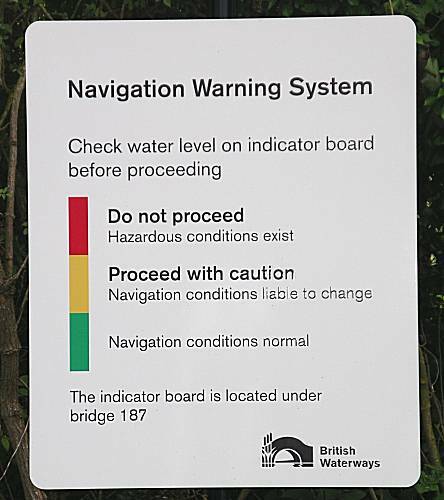 The warning signs at Aynho Weir concerned the crew greatly, but their determination to complete the mission drove them on through the hazardous waters. They were confident that their superior skills would enable them to navigate the treacherous waters. 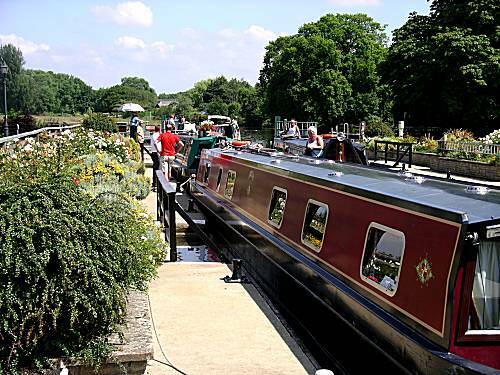 Despite their concerns the narrowboat team arrived at Aynho Wharf, where few mooring places existed. Mooring at a location slightly encroaching some long term moorings, they hurried to sample the ale on offer at the Great Western Arms. Old Hooky at £3-00 per pint proved excellent quality and the healthy menu also appealed to their palates. After showers, the crew returned for curry dinners, with extra chutney, bread & humous. Discussions with the attractive host revealed that they had only taken the pub over some three days earlier and it was obvious that it was now a well run establishment that deserved success. The crew were perplexed to see the local inhabitants using strange craft to navigate the waterways. They returned to the boat at an early hour after an exhausting day. Alan was tasked with getting a picture on the television and the crew then watched News at Ten with a little cheese and biscuits. The crew looked forward to a comfortable and restful night, knowing that Oxford remained within their grasp for Monday evening. 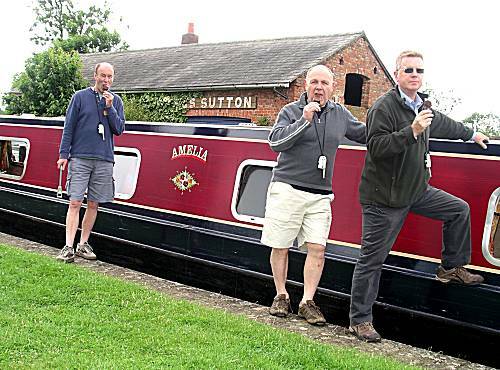 The narrowboaters, except Alan, slept in to the late hour of almost 8am, before preparing further healthy portions of particularly powerful porridge. Neil however, kept his secret porridge formula to himself, despite several spies. 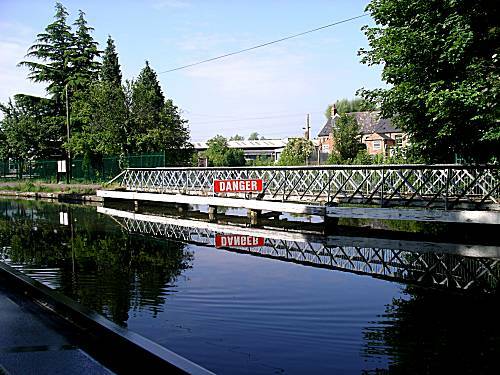 The crew were nervous as they cast off in the knowledge that the very next lock, the infamous Somerton Lock, is one of the deepest on the canal system. Ron elected to take the boat successfully through the the very deep lock, whilst the others stood clear in case of disaster. 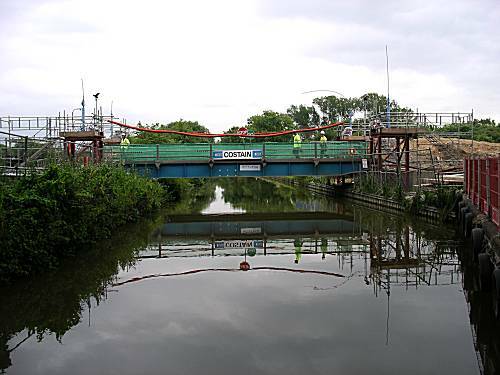 Neil's immense strength enabled a bridge to be lifted to allow the narrowboat onward to its destination. Due to the intolerable pressure that crew were under, they failed to spot the course of the Roman Road, which crossed the path of the canal before Pigeon's Lock. Just before Lower Heyford, the crew came across a young gentleman on a strange bicycle contraption coming towards them. The compassionate crew offered the lad safe passage on the narrowboat as far as Oxford, in return for many narrowboating duties. 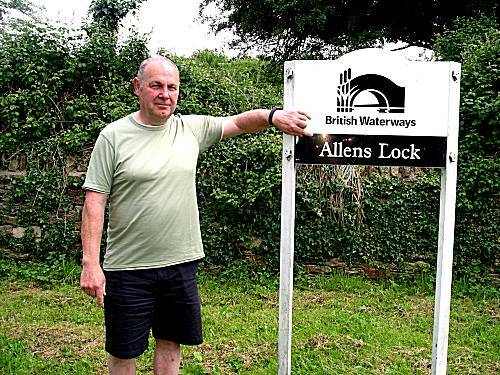 Neil and Alan felt at home on this section of the canal with locks named after these great mariners. Under great protestations, the skipper ruled that a lunchtime stop at the "Rock of Gibraltar" in Enslow was not admissible, due to the vast distances that had to be achieved before nightfall. Certain disaster was narrowly averted when the crew accurately manoeuvred the craft past a submerged tree trunk. 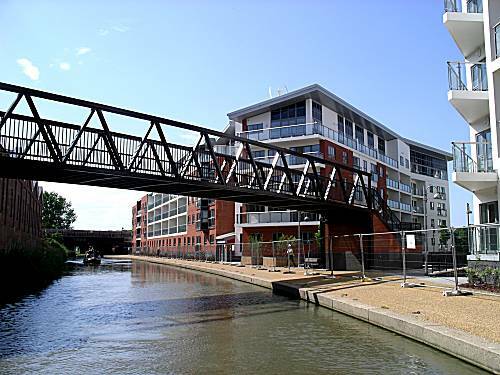 DISASTER OCCURRED BEFORE OXFORD - When with Neil driving under a small bridge, The bicycle on the roof came into contact with the bridge and was wiped clean off the roof!!! Alan on hearing the dreadful noise dashed out to see the bicycle hanging from the side of the boat precariously by one pedal. Single handedly he rescued the bike and placed it safely into the front of the boat, much to the admiration of all those surrounding. 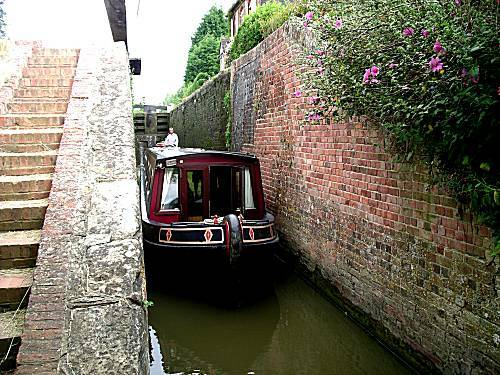 Later, as the narrowboat approached their destination for the night at Oxford, they encountered an immoveable obstacle blocking their passage. However, after explaining to the building site staff the importance of their mission they agreed to lift the obstacle on hydraulic rams sufficiently for the narrowboat to squeeze beneath. 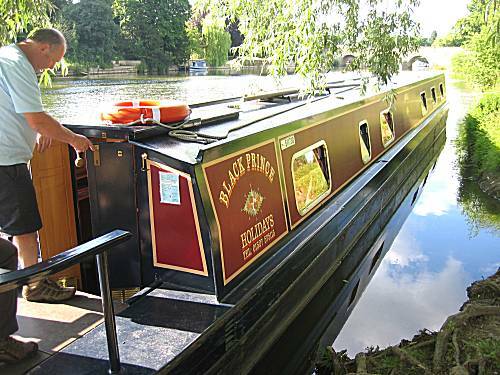 Narrowboat Amelia drew into its moorings in the heart of Oxford. Andy, their adoptive member of crew for the day, skilfully took them to a little known public house, known as the Gardeners Arms. There they sampled Wychwood Wizard ale and when Andy's partner arrived, feasted upon the vegetarian menu. On leaving to return to the boat, they said their farewells' to their extra member of their crew for the day and returned for small portions of Cheese and biscuits, before retiring to their bunks fearful of what the following day might bring. 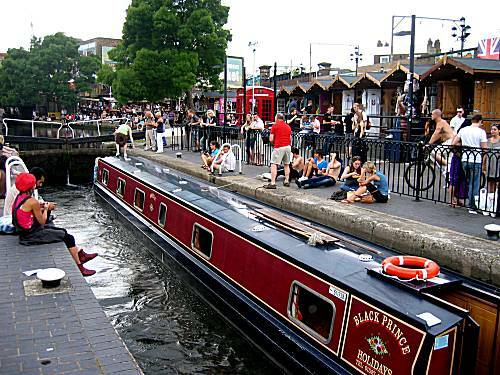 The crew found it difficult to settle knowing that they would be leaving the relative safety of the canal system for the Thames first thing in the morning. After piping hot plentiful porridge, they set off towards the final lock, which was being painted by a couple of friendly British Waterways staff. On leaving the lock into the Thames they wished the crew the very best of luck in the hazardous conditions. 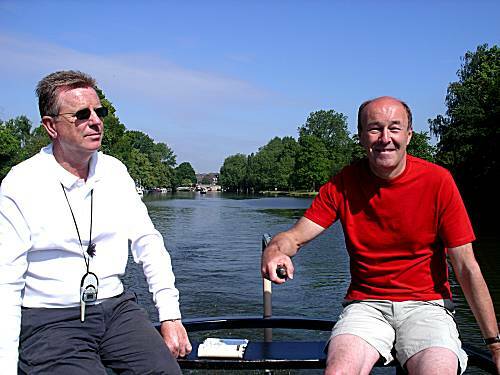 The very tight turn was accomplished faultlessly with Ron on the Tiller. 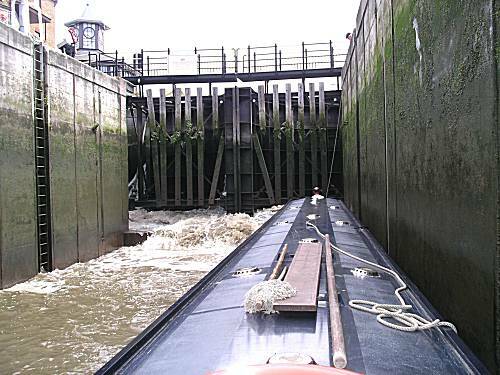 The following locks proved quite busy and the crew suffered some crippling delays to their progress. 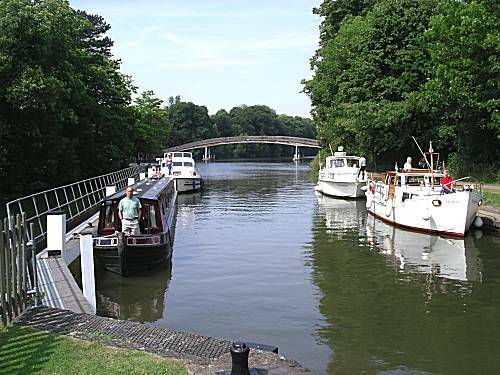 As stocks of certain critical provisions had run dangerously low the crew moored adjacent to the bridge at Abingdon where they successfully located a Waitrose and purchased additional bread, milk and pork pie. Although the river was wide and the sun hot, Neil found it difficult to relax knowing the dangers that existed ahead. 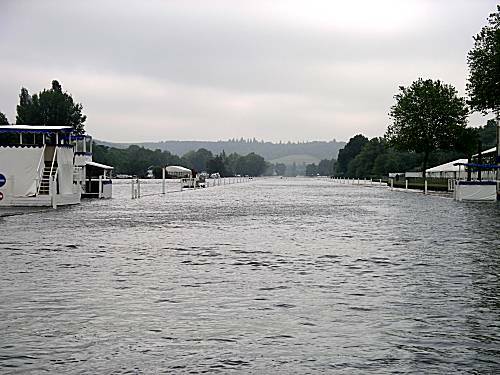 The narrowboat continued on its difficult journey to their planned stopping point for the evening at Wallingford, although stories from other boaters spoke of impossible mooring conditions. 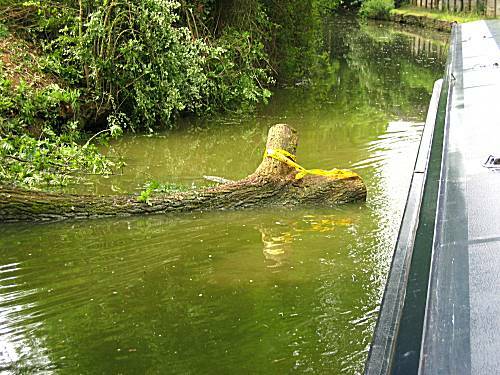 Despite the impossible mooring conditions at Wallingford, the cunning crew quickly located a suitable position adjacent to some tree roots. After skilfully turning the boat it was soon fastened to the tree roots and nearby fence. The locals were amazed at their ingenuity. After a tour of the town and in particular the Cholsey & Wallington steam railway, which was closed, the crew returned to their boats for showers. The crew had been quick to spot that 6 oz steak meals were on sale for only £2-99 at 'The Boathouse' pub with a riverside setting. Spitfire ale, at £3-01 per pint was chosen to accompany the food. After returning to the boat, the crew reflected upon how well they had adapted to the River Thames, but were only too aware that they should not become complacent , with the difficult conditions. 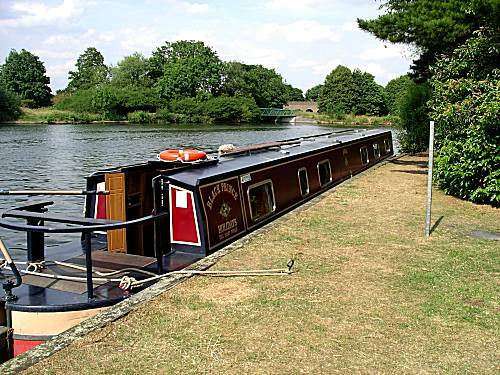 They retired to their bunks only too aware that they had to reach Henley-on-Thames for the following day, a distance of 25½ miles with a further 8 giant locks. 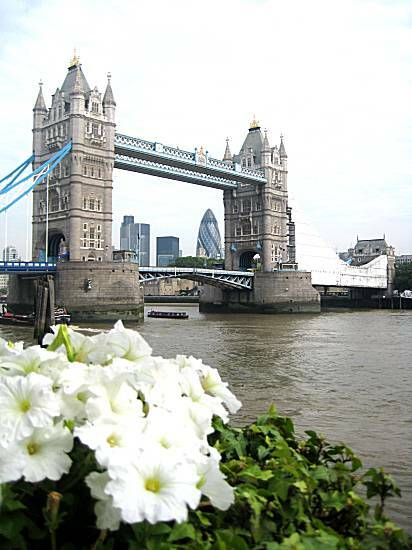 The crew awoke early (except Alan), eager to continue their groundbreaking journey down the Thames. Pleasing Potent Porridge was consumed with gusto, before setting off at 8-10am. They were very conscious that fresh water supplies were at a dangerously low level and replenishment of the tanks was crucial . Water supplies were located at Cleeve Lock and the crew were relieved to fill their tanks before entering the lock. They were quick to reward themselves with coffee with Hob Nobs. 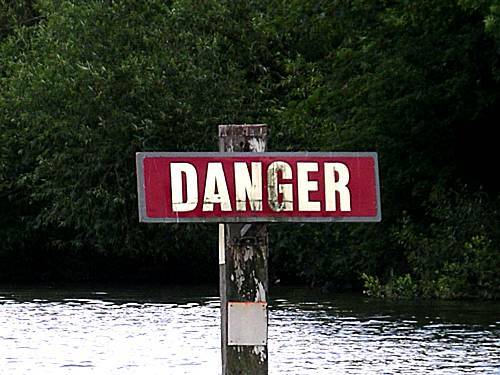 The lock keeper at Goring was keen to warn the crew of hazardous conditions before Pangbourne when barges and heavy lifting gear were in use to recover a stolen car from the river. The crew took these hazards within their grasp and no problems were encountered. 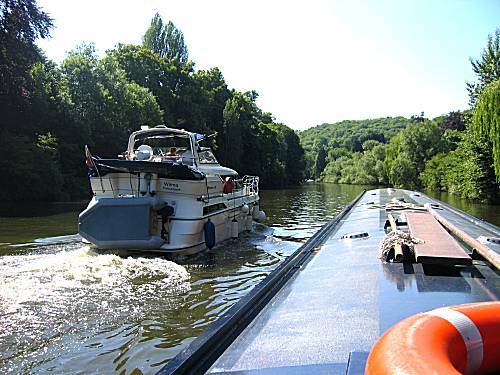 Fast ocean going craft followed the narrowboat at dangerously close distances, but the crew were unperturbed even when they chose to overtake the boat at inappropriate places. The crew were so pleased with their progress that they rewarded themselves with "Feast" ice creams. The crew were amazed to see David Hasselhoff pass in a narrowboat with film crew. 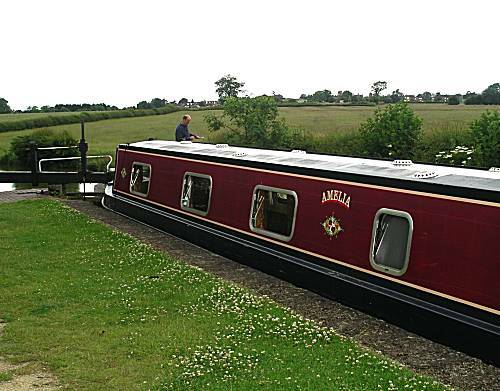 Not surprisingly, the film crew took time to include the narrowboat "Amelia" in their shots for broadcast at a later date on television. 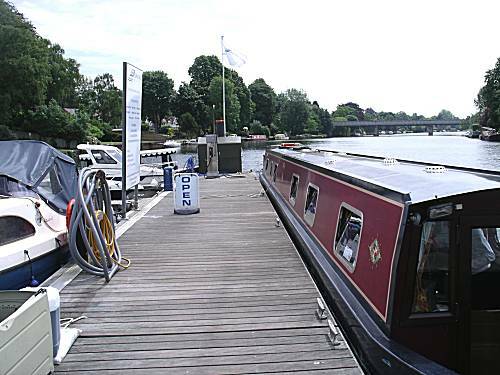 Shortly after passing Mill Lock the crew quickly analysed the mooring situation for Henley and choose a quiet superior mooring approximately ½ mile short of the main town and bridge. 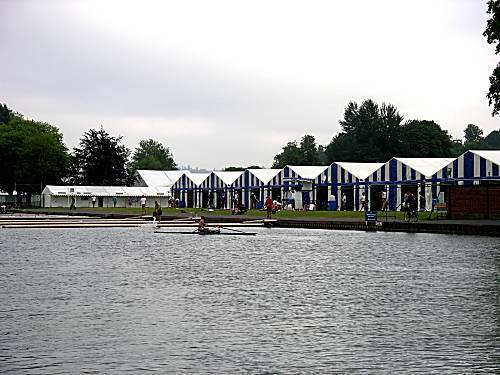 Knowing that the Henley Regatta started the very next week, the crew were aware that the build up would be in full swing. The mooring charges of £8-50 were paid and the ticket displayed, whilst the crew considered and listed, what top-up provisions needed to be purchased at the next opportunity. After showers the crew made their way to "The Angel on the Bridge" where Racks of Ribs were enjoyed, together with Brakspear ale at £3-40 per pint and served in plastic containers. Afterwards the crew moved on to the "Argyll" for Abbots Ale at £3-50 and then stopped briefly at Wetherspoons for the same ale at £1-99 per pint. The crew returned to test the recently purchased cheese and biscuits, before retiring for well earned rest. The crew were all awake early, anticipating another fine day of cruising to their scheduled overnight mooring in Windsor. 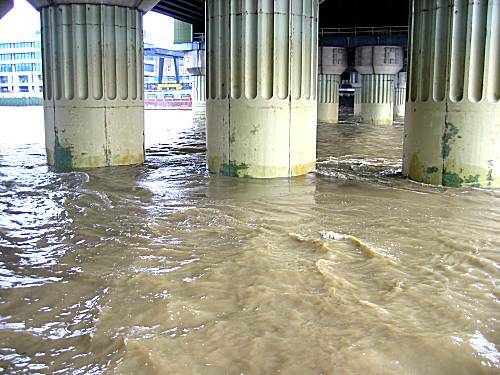 They were all hiding their fear very well, but secretly aware that the treacherous tidal areas of Thames were less than 2 days away. Punctual and Pulsating Porridge soothed their nerves at they cast off to continue their epic journey. Considerable delays to the crew's mission were encountered at the following locks, due to high levels of shipping in the area. As the crew had failed to have a nourishing breakfast on the previous day, they were acutely aware of the need to adequately build up their strengths for the forthcoming difficult waters. 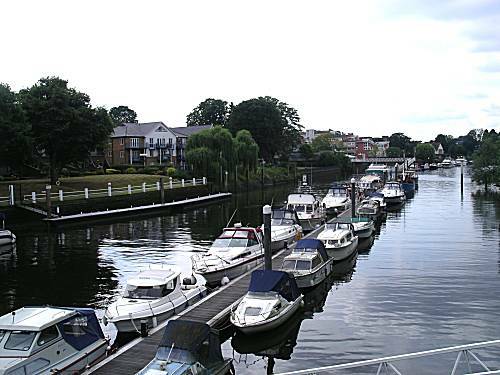 Having selected a suitable area to stop at Bourne End, they were dismayed to find no mooring spaces available. 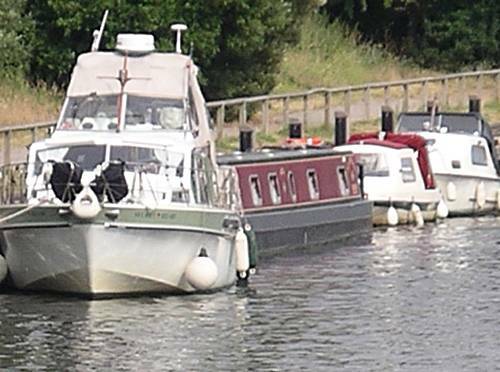 They therefore put Alan's cunning plan into action and turned to call at the Bourne End Marina to top up with 77 Litres of fuel. Using their advanced skills, they persuaded the considerate boat yard staff to allow the narrowboat to stay at the fuelling jetty, whilst they consumed their breakfast. 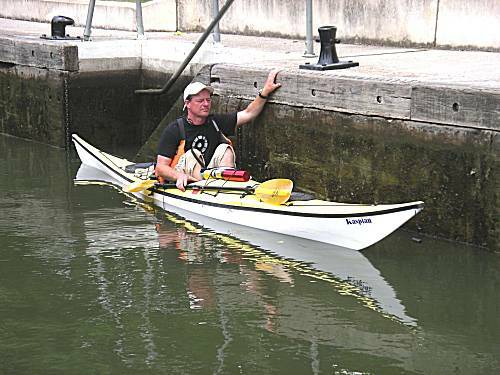 Whilst in Marlow Lock, the crew spoke with another brave mariner who was taking his canoe the entire length of the Thames, through London to reach Southend in 5 days. The crew compared his skills and bravery to their own. Overcoming terrible conditions the crew brought the narrowboat safely into excellent moorings close to the Leisure Centre in Windsor. 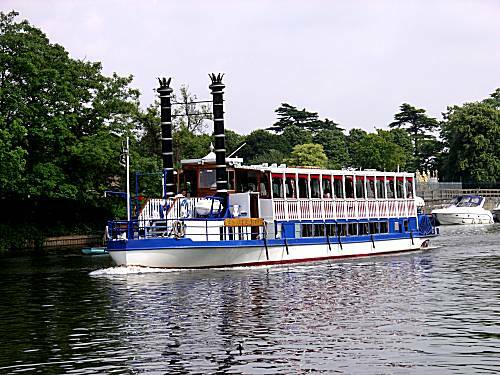 Beyond all expectations the narrowboat had arrived at Windsor completely on schedule, but the skipper was unable to establish what stress had been endured by the crew. Alan & Neil were dispatched to find a Waitrose supermarket, where provisions including additional Smoked Mackerel fillets were procured. Unfortunately the Magnum ice cream shop was closed on their return and they were unable to reward themselves for their extreme endeavours. On returning from the shops, jubilant with their purchases, Alan & Neil were horrified to find that the intolerable pressures on the crew had taken its toll with Ron, who had collapsed with exhaustion shortly after reaching Windsor. The skipper felt that shore leave to the local Wetherspoons was the only cure possible. 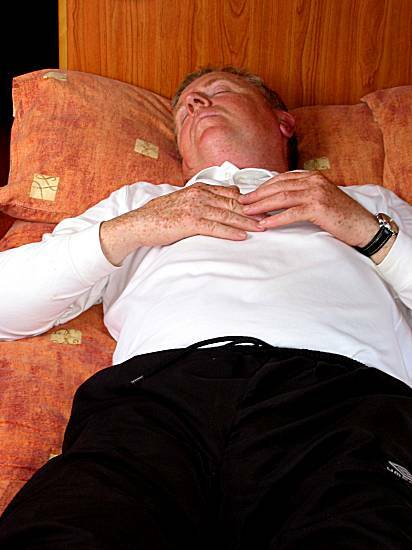 WILL RON RECOVER FROM HIS EXHAUSTION? WILL THE OTHER CREW SUFFER THE SAME FATE? SHOULD THE SKIPPER DECIDE NOW TO ABANDON THE ADVENTURE FOR THE SAKE OF HIS BRAVE CREW? Luckily Ron gained consciousness and was able to construct a few words, but the crew were only able to recognise 'Beer' and 'Pork Pie' in his mutterings. Recognising the symptoms, they quickly got Ron to the "King & Castle" and after a curry dinner with a free pint of Marstons Pedigree at £5-99, he rapidly made a full recovery. The cure was completed with some further Pedigree, together with no cheese and biscuits back on board. 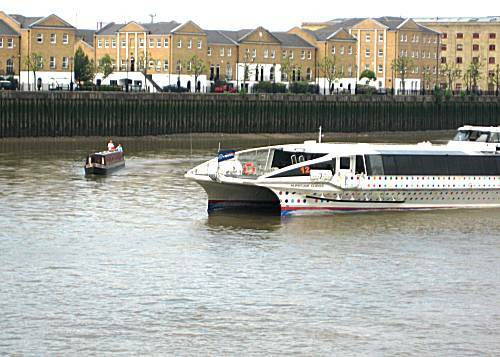 They retired to their bunks mindful that only one day of cruising on the river remained before they encountered the dreaded Tidal Thames. The excitement of the previous day caused the crew to sleep into the late hour of 7-50am, when Neil hurried to prepare his Pleasing and Particularly Pleasant Porridge for the hungry crew. 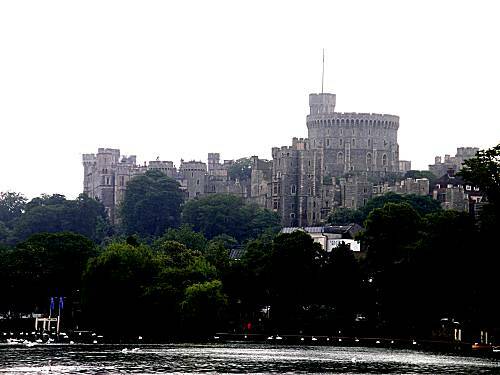 Good views of Windsor Castle seen by the observant crew, as they departed the town. Initially the progress was good as the narrowboat passed through lock after lock as it continued on its relentless journey towards the capital. 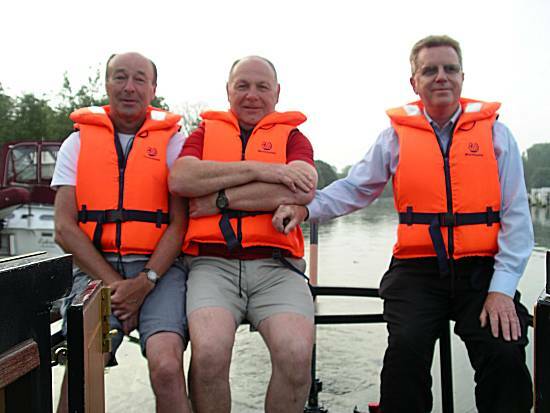 The crew were seen to marvel at the wonders of Runnymede, Staines and Penton Hook Lock, until they reached Chertsey!!! A power cut affecting much of the area resulted in the lock system grinding to a complete halt. Intolerable pressure built up as tensions rose to unbearable levels. 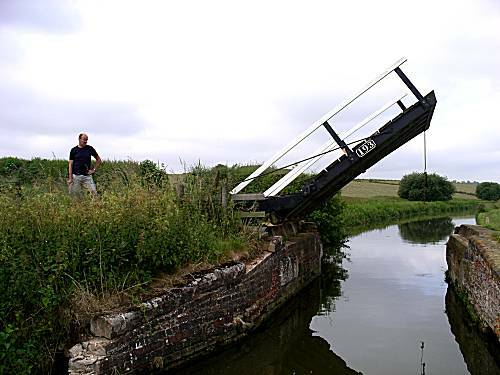 However, again the crew of the Narrowboat 'Amelia' devised a cunning plan and saved the day. 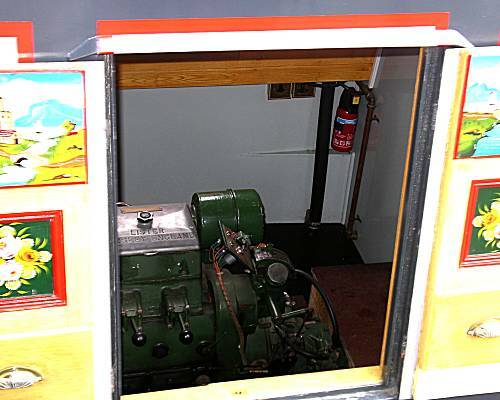 Having analysed the problem and fully understanding the complex hydraulic systems of the lock, the crew set about devising a method of opening and closing the lock gates using a manual hydraulic pump. Much to the amazement of the other boaters and the lock staff, the crew took turns to rotate the massive pump by hand, slowing inching the giant lock gates open. 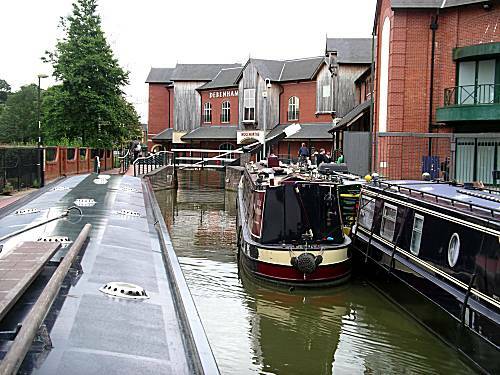 The narrowboat was quickly able to continue its journey leaving the other boaters in total awe of the situation. After the excitement of this event the crew quick moored to enjoy a nourishing salad of smoked mackerel fillets with salad cream and extra pickled onions. They sat back relaxed knowing that they had yet again saved the mission. 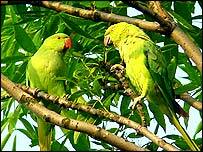 Ron and Neil commented on numerous ring necked parakeets in the area. The Laleham flock is rumoured to have originated from escapees from the nearby Shepperton Film Studios that broke out during the shooting of a film set in the tropics. 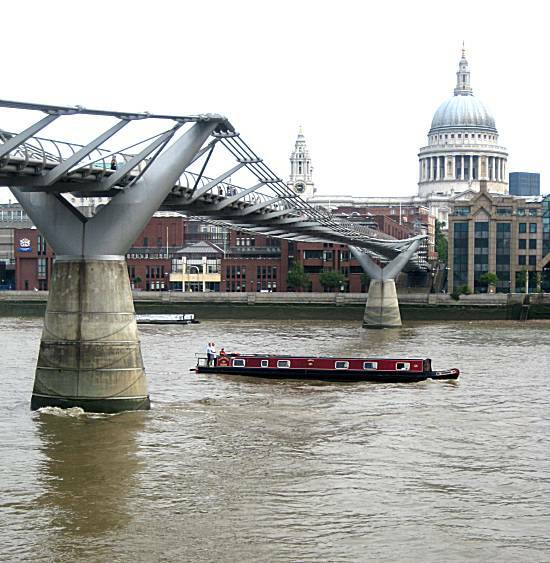 The next sections of the journey were un-eventful, but many strange craft and creatures were seen on the Thames in this area. 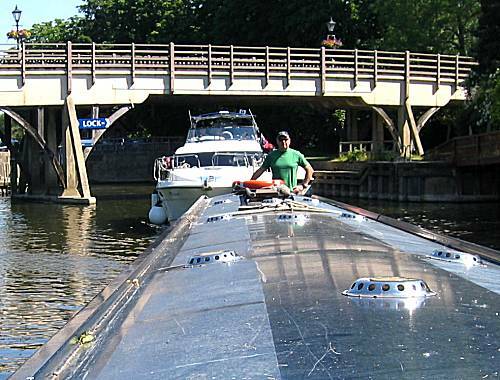 Neil expertly squeezed the narrowboat into a very limited mooring just before Teddington lock. 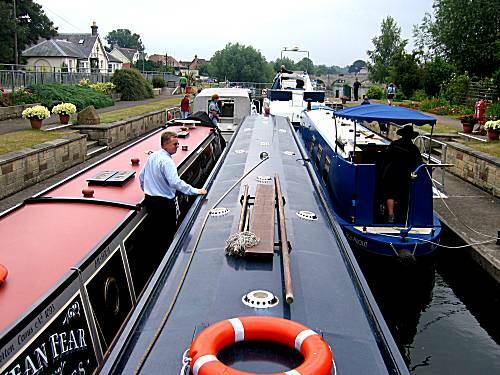 Ron and Alan quickly visited the lock keeper to book their passage through the lock at 6am the following morning and also to pay the £7-00 mooring fee. 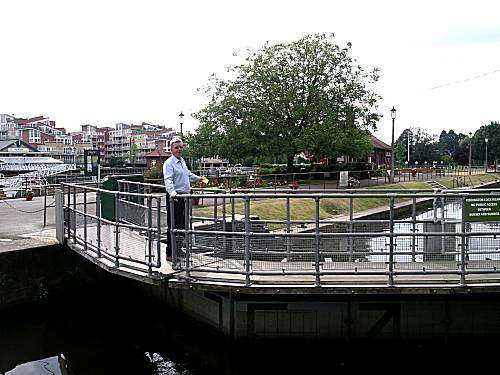 Ron was in awe of the giant Teddington Lock, but secretly worried about the crew's fate the following day. 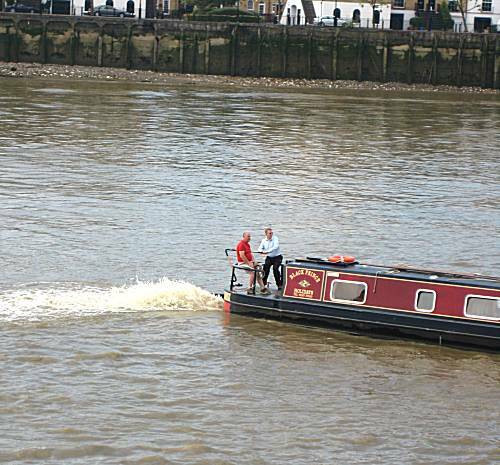 The crew were quick to realise that there were no other narrowboats moored and planning to attempt the passage of tidal Thames. This worried them greatly!! The crew felt that they needed to calm their nerves for the evening by visiting the "Tide End Cottage" for ale and an evening meal. They enjoyed meals of Steak & Ale pie with mashed potato & gravy (except Ron). Abbots Ale was enjoyed at £2-80 per pint, before the crew felt it necessary to walk part of their morning route. 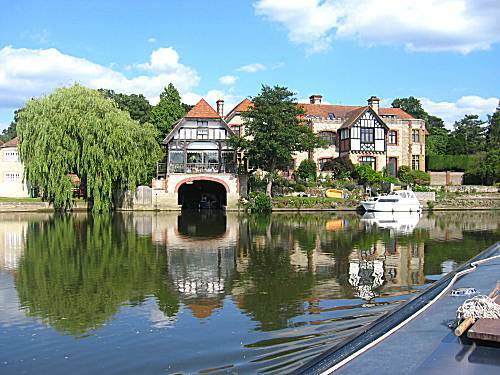 The Thames pathway way investigated almost to Richmond as the crew grasped at information that would assist them with their passage in the morning. The crew met the lone canoeist seen earlier on the expedition and the crew agreed to help carry his canoe to the waterfront at 5-45 the following morning. As the weary crew returned to the boat they felt need to try London Pride at 'The Anglers' at £2-90 per pint, but felt that although the atmosphere was good the ale was a little flat. Afterwards they returned to the boat, but were unable to manage any cheese and biscuits and merely managed to sip a little soothing hot chocolate. After setting their alarm clocks for 5-15am they retired to their bunks and attempted to sleep, knowing that the morning trials would soon be upon them. The apprehensive crew set off through the giant Teddington Lock and into the unknown and dangerous waters of the tidal Thames. 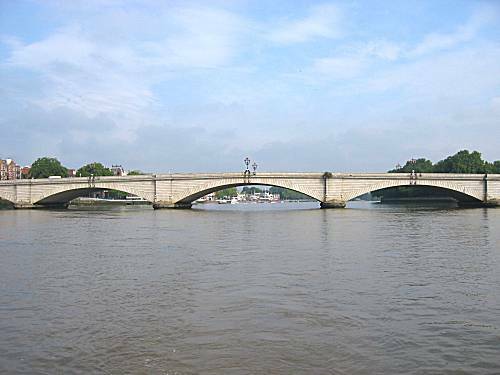 The crew counted the 29 bridges that they would pass, admiring Putney Bridge, before the waters became rough. 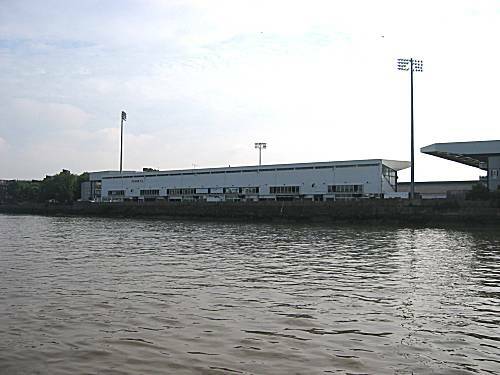 Fulham Football Club appeared quickly as they were swept downstream at great speed. 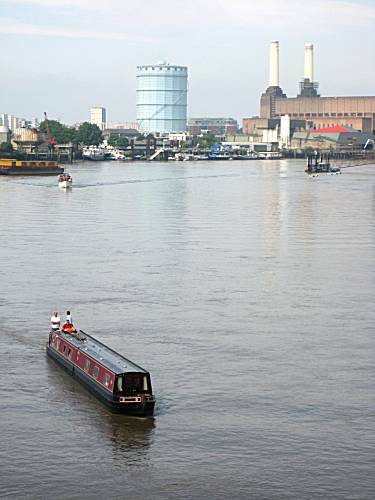 Narrowboat "Amelia" was first spotted by an observer on a bicycle approaching Battersea Bridge. 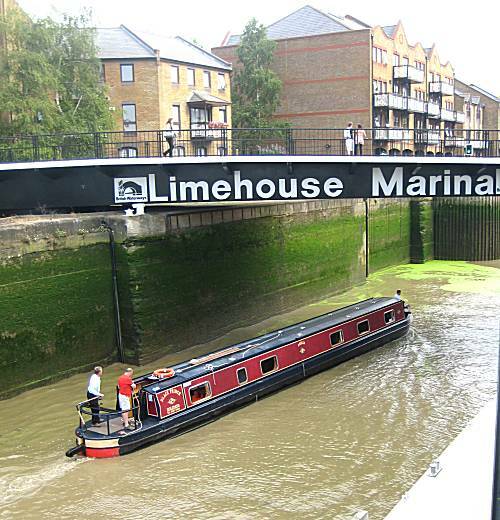 The crew were un-perturbed by the intimidating size of Limehouse lock and the giant rotating gates. 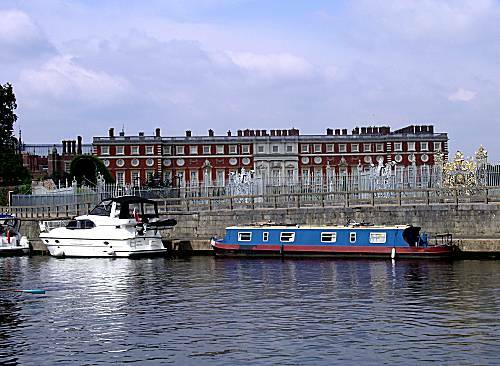 Although there were no temporary moorings available in the Marina, the lock keeper, recognising the exceptional skills that the crew had displayed, allowed them to rest in the lock cut for a while. Mark (on-shore photographer) was quick to welcome the crew from the Thames, by presenting them with celebratory selection of pies. As is customary after periods of excess stress, the crew quickly prepared a calming healthy fried breakfast, with extra mushrooms. 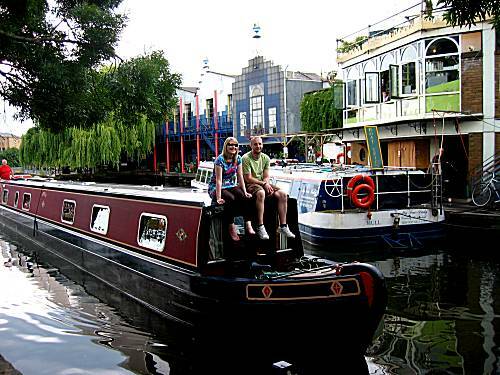 The crew were soon aware that their next battle was to tackle the Regents Canal through the heart of the capital. Spending a little longer than planned at Limehouse, due to the statutory recuperation necessary, after the stressful transition of the Thames, the narrowboat left Limehouse with Mark (photographer and Son + bike) on board to tackle the first of the giant Regents Canal Locks. All the crew were amazed how clear the water was, although this did mean that all the debris in the canal could be clearly seen. The news was out and crowds of well wishers lined the waterfront to welcome the crew back from the dangerous tidal Thames. 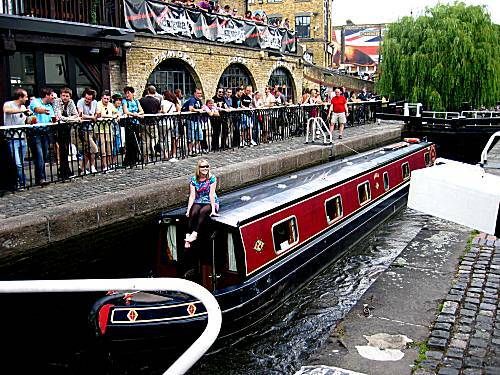 Incredible scenes of celebrations were seen at Camden Locks, the likes of which had not been witnessed for years. Mark's girlfriend Ann-Marie joined the narrowboat to join in with the celebrations and can be seen at the front of the boat. Many girls commandeered a passing narrowboat in an attempt to board 'Amelia' and overwhelm the crew, but they successfully defended the attack. 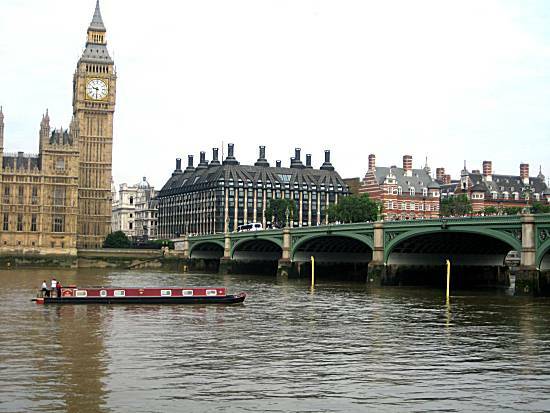 The narrowboat continued on it's journey through central London. 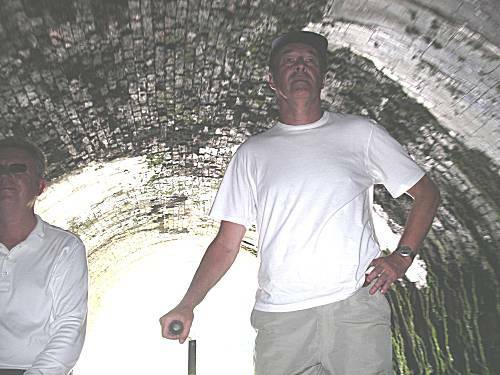 Mark and Ann-Marie sat at the front of the boat but were unaware of the dangerous Angel Tunnel (960 yds) ahead. 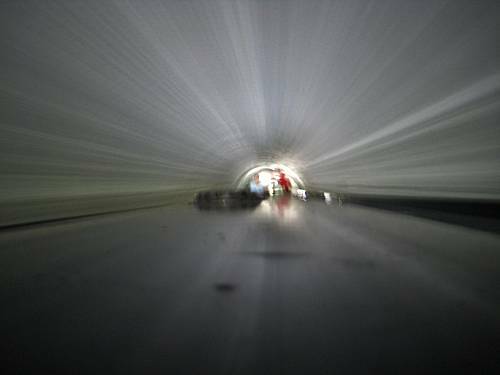 The crew decided to take the narrowboat through the Angel Tunnel at 'Warp' factor speed to minimise any distress to the passengers. 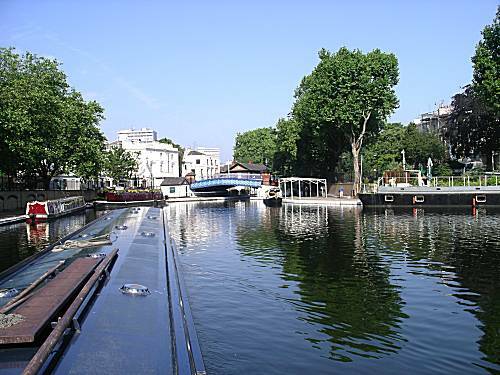 After travelling the length of Regents Park the crew admired the views of Little Venice. 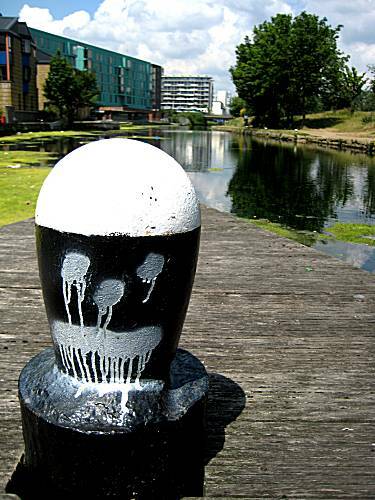 Mooring, including a 'text book' turn by Neil, was achieved in Paddington Basin just before a heavy thunder storm. The crew and visitors finished the remaining wine supplies. Steak Dinners (Except Ron - Salmon), were enjoyed at the Sawyers Arms in Paddington, together with Adnams Broadside ale, which met with the exhausted crew's full approval. 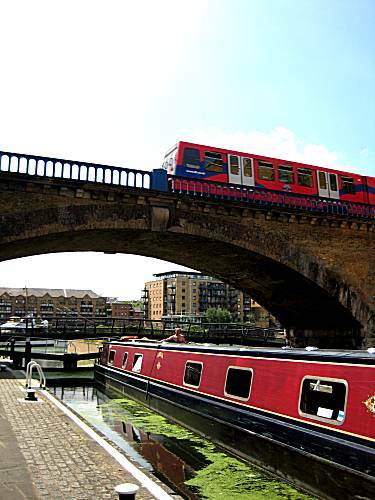 After Mark & Ann-Marie left the narrowboat to return to their home by underground railway, the crew prepared for their bunks, without the benefit of any cheese and biscuits. The crew departed London at 8-30am after Mark had returned to collect his bicycle. Promisingly Positive Porridge enabled the narrowboat to depart to enjoy the delights of Wormwood Scrubs, the A40 Westway flyover and Park Royal industrial estates. The water tanks were replenished at Greenford, before a difficult, but wonderfully executed turn, was made at Bull Bridge junction by Neil. 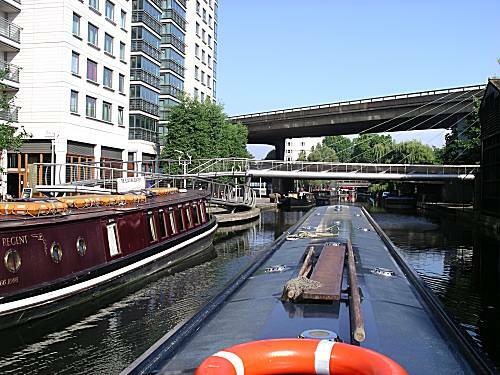 The crew were amazed by the giant aqueduct that enabled the canal to cross the North Circular Road close to Hanger Lane. 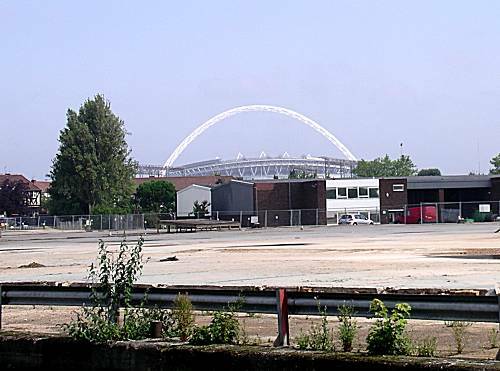 The crew marvelled at the new Wembley Stadium that could clearly be see from the Grand Union Canal. Because of the torturous schedule that the skipper had dictated for this section of the mission the crew agreed the use of all super human effort in an attempt to get ahead of their planned stopping point. They therefore travelled onward through Cowley and Uxbridge to reach Harefield. Healthy dinners of Fish Pie (except Ron) were enjoyed at the 'Coy Carp' accompanied by London Pride, that the crew felt was a little flat. Small portions of cheese and biscuits were sampled with their Hot Chocolate, before the crew took to their bunks, excited that they were again several hours ahead of their torturous schedule. However, they were unable to rest knowing that an important, but fearful task, had to be performed in the morning. Some time elapsed before they immerged from the task, but they considered that, despite a few extra lumps, they had achieved a good result. The crew realised that for the next few days a massive number of locks had to be passed and the total for just today totalled 30. 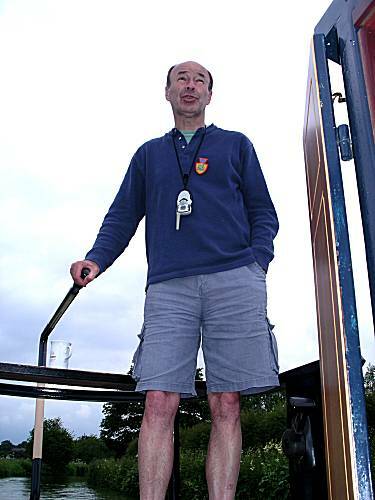 Whilst sharing a lock with another narrowboat, with inexperienced crew, Ron heroically attempted to keep the boats apart. 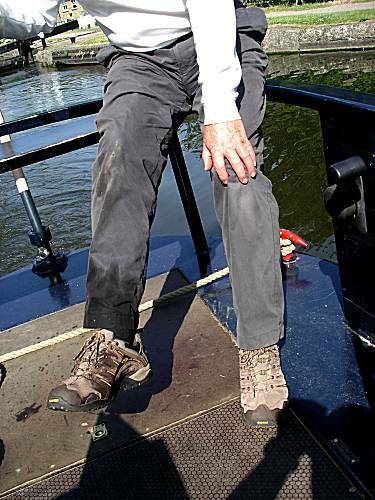 As a result of the other boats actions, Ron sustained a wet right foot, hurt knee and shoulder. Characteristically Ron made light of the matter, but the other crew feared for his health, knowing that their cooked breakfasts depended on him. 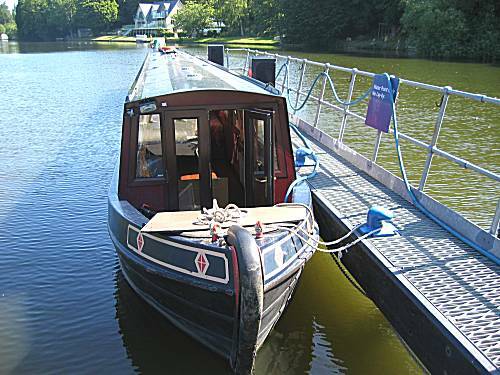 Despite the crew becoming tandemmed with two ladies, in a narrowboat in very poor mechanical condition, they were able to make further progress ahead of their schedule, by reaching Berkhampstead for the evening. 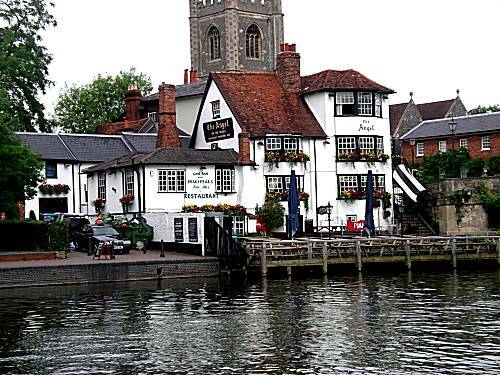 Although the crew were desperately tired after their mammoth journey that day, they were able to summon strength to visit a very busy and lively public house known as "The Boat". There they managed a little London Pride and nibbled at a dinner of chilli con-carne (except Alan & Neil). They were impressed with a walk round Berkhampsted and located a Waitrose store that opened at 8-30am that was needed to obtain further supplies of bottled water due to the high consumption in the excessively hot working conditions. The crew returned to the boat unable to manage any food or drink and retired to their bunks in an exhausted state, but expecting a good night in their clean sheets. The crew again awoke at an early hour anxious to start the ascent of further locks. After Perfect Pleasing Porridge, Neil left to collect new supplies of bottled water (sparkling) from Waitrose, whilst Alan and Ron tackled the first two locks alone. 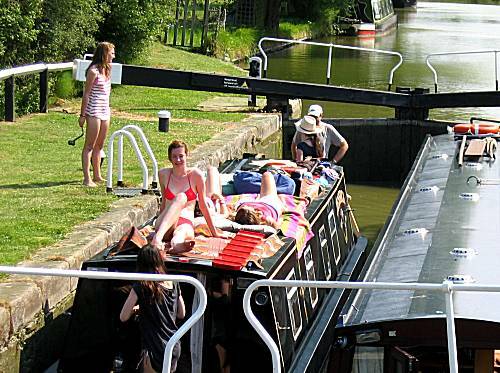 The crew decided that they needed to remain ahead of plan and decided on another torturous day with a further 30 giant locks, aiming to reach Leighton Buzzard for the evening. 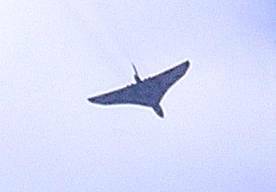 This was a tough target in distressingly hot conditions. In a responsible way the crew decided not to have a cooked breakfast, but to have a healthy salad lunch with just a little pie. Fresh fruit salad was prepared, but unfortunately they ran short of time and it therefore had to remain safely in the fridge. 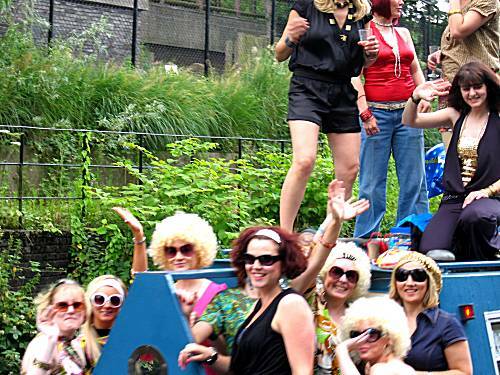 Much to the surprise and amusement of the crew, they passed a moored boat with numerous young scantily dressed females. Shortly afterwards they noticed that the boat had set off and was following them to next lock. It transpired that there were 8 girls on board the small craft for a 4 day trip. 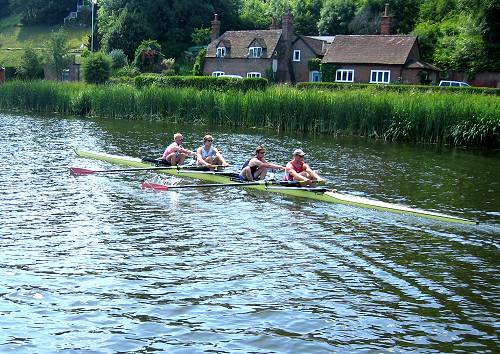 The crew battled on "Lock after Lock" in the unbearable heat knowing that they had to reach Leighton Buzzard. With a recommendation from a friendly passing boater, they opted to reach "The Globe" for evening food and entertainment. Eventually they pulled into quiet moorings just short of the pub, close to an adjacent sewerage works. They were hungry, exhausted, dirty and in need of nutrition and maybe some ale. They looked forward to showers followed by the short walk to "The Globe". 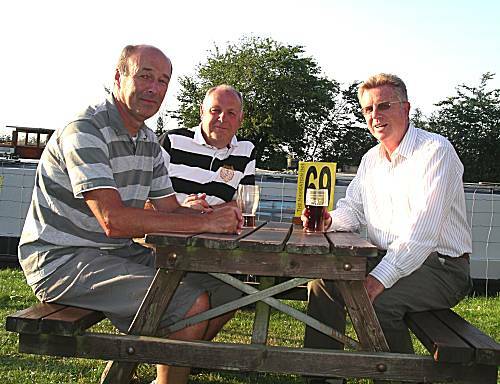 The Globe exceeded the crew's expectations with excellent Abbots Ale and dinners of Gammon, with Eggs & Pineapple (Except Ron), consumed outside in a pleasant canalside setting. The crew were early to rise, anticipating another busy day on board. The hard and desperately long two previous days, had meant that "Amelia" was now almost a full day ahead of schedule. After Plentiful Pulsating Porridge, Neil carried out a re-calculation of the options for overnight stops, with three relatively leisurely 8 hour days. On condition that no more disasters occur, it was agreed that the crew strive to reach Cosgrove tonight and Weedon the following night. This would mean that Napton would be the target for Friday night, close to the starting boatyard. The narrowboat set off quickly and efficiently passed four locks, before some quite long stretches of relaxing canal. 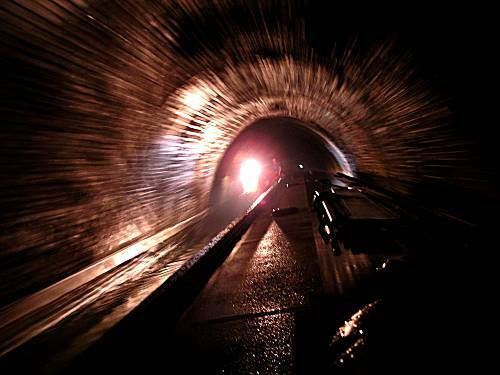 The stress caused to the crew merely discussing these fearful tunnels required them to immediately moor close to Milton Keynes and for Ron to prepare an excellent cooked breakfast with fresh Orange and Mango juice. 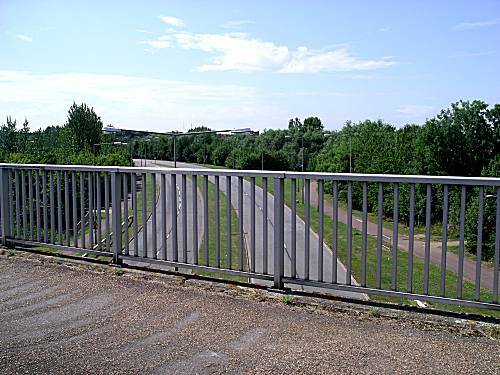 The authorities arranged for the Milton Keynes by-pass to be closed to all traffic whilst the narrowboat made its way slowly and carefully over the aqueduct, so as to keep vibration to a minimum. 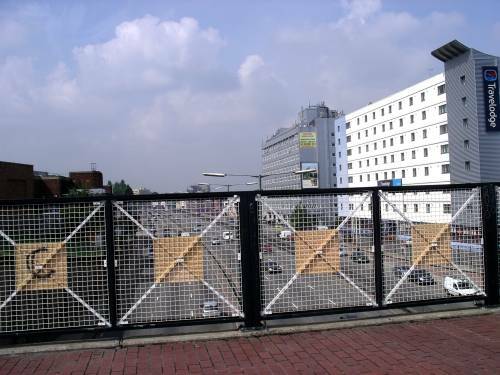 Much development of the Milton Keynes area had been carried out in readiness for the passing of the now famous narrowboat "Amelia". Cunningly the crew found a shaded mooring spot when they arrived in Cosgrove and were quick to share their last supplies of fresh fruit salad. Due to the incredible progress that they had made that day, arriving at 4:45pm, the skipper allowed a short relaxation period for the crew. They were looking forward to dinner at 'The Navigation' that evening and either "The Reverend Jones" or "Olde Trip" ale, but the thought of the 3,057 yds Blisworth Tunnel the next day, prayed heavily on their minds. 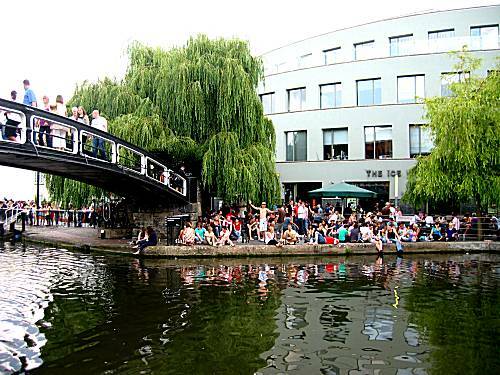 The crew enjoyed restful healthy non-fattening dinners by the side of the canal, with a little Olde Trip. Neil felt need for an additional pint of ale, which the other crew declined. No cheese or biscuits were consumed on board, as the crew had exhausted all supplies. Due to the excess heat they elected to retire to their bunks leaving the front doors of the boat wide open. They only fell into light sleep in fear of possible attack, but delighted that there had been no disasters that day. The crew awoke even earlier than normal, fretting about the dangerous Blisworth Tunnel that would be upon them only too soon. However, putting it at the back of their minds they Prepared Perky Pugnacious Porridge, before setting off for a 2 hour cruise towards the Stoke Bruerne flight of 7 locks. The crew joined up with another very pleasant couple, in a medium sized narrowboat and assisted their passage through the difficult flight of locks, as well as saving water in a very responsible way. The settling ice creams prepared the crew for the daunting 3,076 yd Blisworth Tunnel, which they knew started only a few hundred yards out of the village. Narrowboat 'Amelia' gently entered the tunnel hopeful that they would not meet a boat coming towards them. Neil elected to navigate the boat through the tunnel, although the strain can be seen on his face. 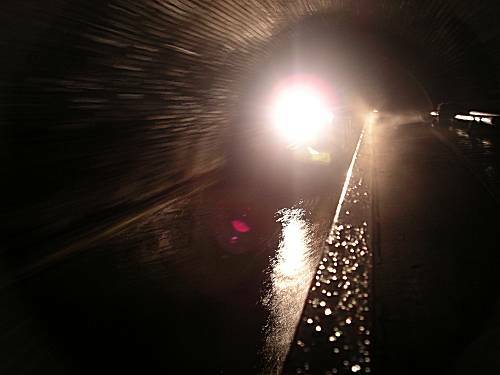 Neil's worst fears materialised when a narrowboat appeared out of the misty tunnel travelling at great speed and having an inexperienced crew. 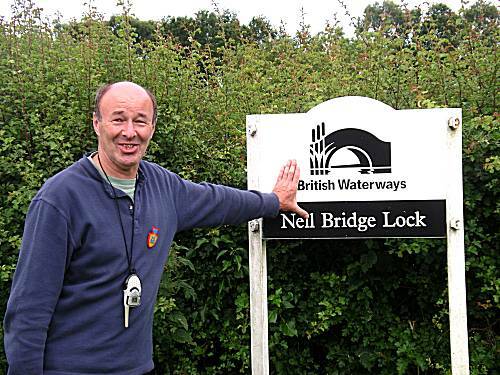 Only Neil's quick reactions saved their narrowboat and crew from a fearful end. The crew were overwhelmed with happiness to see the boat emerge at the end of the tunnel and were in great appreciation of Neil's super-human skill's by navigating the narrowboat to safety. They immediately moored in a shady location and prepared a healthy lunch of egg sandwiches and hot-dogs, with French mustard. 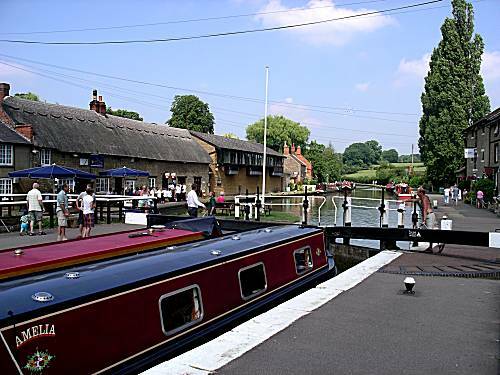 The crew left the safety of their moorings in Blisworth for the 3½ mile journey to their planned stopping point for the evening at Weedon Bec, knowing that they had yet still to pass the Gayton Junction. Arriving at Weedon Bec at 4-30pm, Neil was sent to investigate the possible eating and drinking establishments in the town. Neil returned reporting that Weedon Bec was not the quiet village that the crew had expected, but busy and noisy having the A45 going right through the middle and being not far from the main west coast railway line. He recommended the nearest pub called "The Heart of England", where the crew enjoyed 2 for 1 steak dinners and Marston Pedigree Ale. As supplies of cheese and biscuits had been exhausted some days ago, the crew sat for a while at the back at the boat in the fading light, contemplating their successes over the course of their adventure. 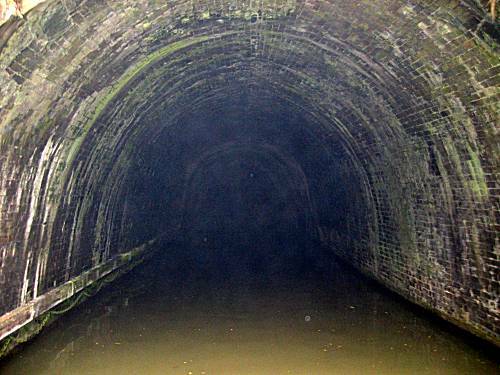 However, they reminded themselves that although there is only one day left, they still have a number of fearful obstacles, including the Braunston Tunnel (2,042 yds), which could still could cause their mission to flounder!! They retired to their bunks quietly in deep contemplation. The crew awoke on the final day of their expedition to the sound of rain beating on the roof of the narrowboat. They Prepared Penultimate Porridge, with extra toast, and decided to delay their start until 9-00 am in the hope that the rain would stop. 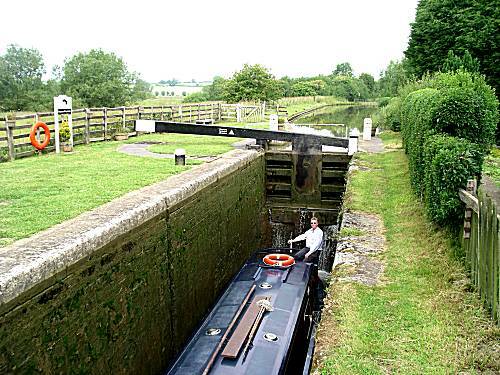 They departed as planned in very light rain heading towards the Buckby flight of 7 giant locks. 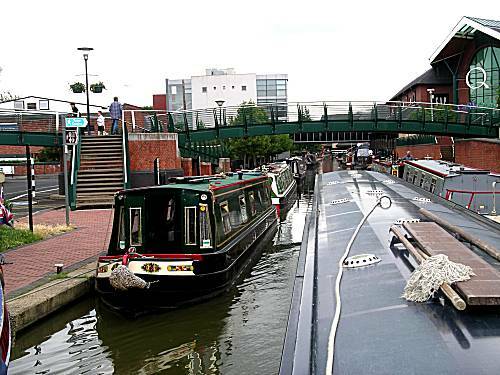 The locks presented no problems for the experienced crew, who by the use of radios and an advance lock preparation scout were able to organise an almost non-stop lock transition, to the absolute admiration of the other canal users. Norton Junction soon passed, where the crew reflected back to a previous successful expedition of the Leicester Arm of the Grand Union. In less than 2 miles the last tunnel of the trip would be encountered!! 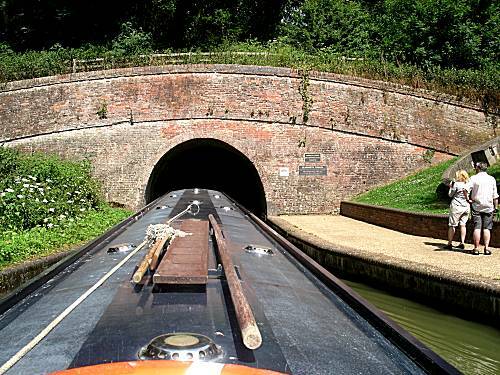 The 2,042 yd Braunston Tunnel is renowned for it's poor ventilation and choking diesel fumes. 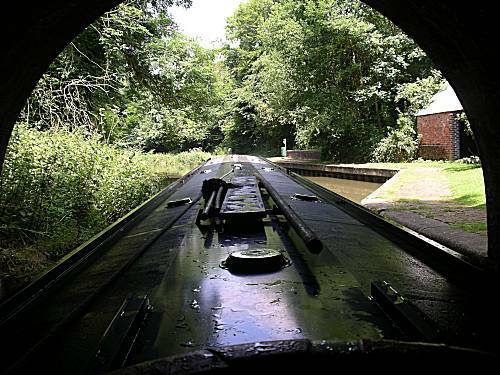 Unable to see the other end, in total darkness, with the possibility of a collision with another narrowboat, all made the crew extremely nervous. 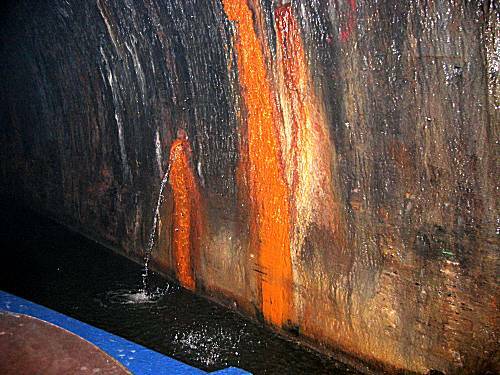 The crew were alarmed to see giant leaks in the tunnel wall that could easily lead to a complete collapse of the tunnel. Yet again the crew had to deal with a boat, with inexperienced crew, travelling at great speed in the opposite direction. The instinctive reactions of the skipper again saved the day and possibly the completed mission. 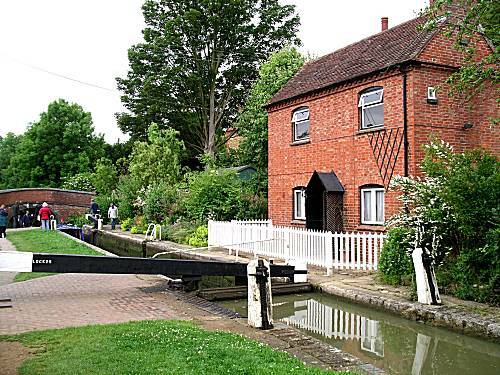 After the stress of frightening experience in the tunnel and tackling the next 6 locks, the crew were thankful to reach the safety of Braunston and quickly stopped to prepare a late breakfast without baked beans, but with scrambled egg. The journey from here took the narrowboat to its home base at Napton, signalling to the crew the completion of a successful mission. As Neil pointed out that stopping at the boatyard would effective isolate the crew from the outside world and any source of food or ale, they chose to pass the boatyard, but this would require a complete 180 deg turn in a very difficult and narrow location. 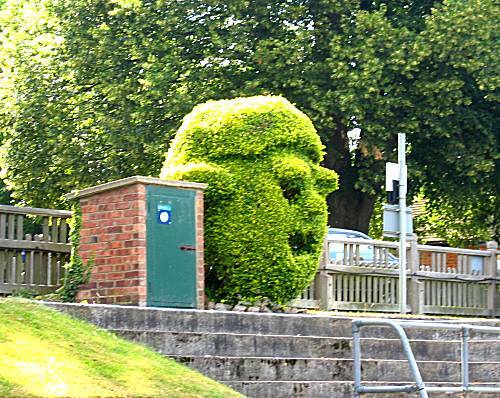 This was accomplished by Ron, just before mooring in close proximity to the Folly Inn. The crew prepared for the last night celebrations of a well planned and executed mission. They selected the nearby 'Folly Inn' for their evening visit, where they looked forward to a night of food and drink. Although the Old Hooky ale meet with the full approval, they considered the food was overpriced and the pub and staff needed a complete makeover. The crew celebrated their successful mission and pondered on their next expedition planned for September. However, they contemplated what more dangerous and daring mission that should consider for next year !! !